Home » Books & Art Journals » And Life Got in the Way! I really meant to get back to my blog/web site sooner! Is it really two months since the last post? It’s been mostly good stuff and creative time. Thinking back, it was the re-occurrence of a back problem that forced me to take a break in the beginning. Long hours at the computer entering data for this web site and winter inactivity probably were factors. Then, I had some really intense creative time….. celebrated a couple of birthdays….hooked up with a couple of new groups here in Calgary….spent a week sister bonding while walking the strip in Vegas….packed and launched hubby who thinks he’s still 20 and wants to spend the spring on a tractor in southern Alberta…. enjoyed a visit with friends from back east….and a whole lot of ‘life gets in the way’! Along the way I managed to make a few birthday cards / albums for siblings. 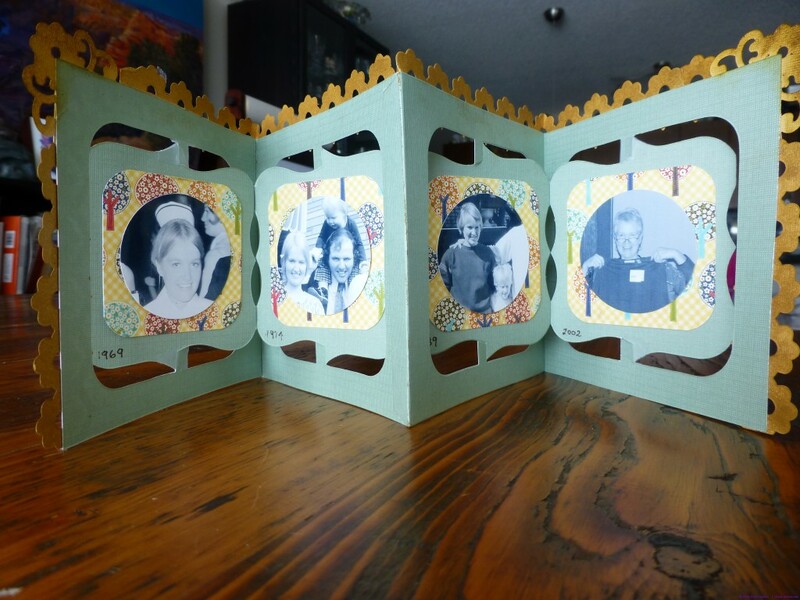 I’m showing part of the accordion album I made for the Vegas birthday girl here but will do a post on albums later. Paper arts are new to me and I’m exploring them as I can see potential for incorporation into some of my mixed media work down the road…..and they are just plain fun with quick results to be enjoyed and shared! So what am I working on right now? At the moment the whole condo has become my studio! Be warned potential visitors! I have three major pieces in the works, all destined for different shows and due early in June! The two most demanding pieces are now advancing well, the third is still in concept stage. I must get some photos today! Speaking of shows, I have had two pieces successfully juried int the Grand National Quilt Show ‘Local Colour’ and they will be shown from April 21 through until June 23, 2013 at the Homer Watson House & Gallery, 1754 Old Mill Road, Kitchener, ON. One piece is ‘Late Season Harvest‘, the second is ‘Alberta Gold‘. If you are in the area between these date be sure to check out this show.